The SES comes only with a 2.0-liter and all-wheel drive; beware, sunny staters. The 2018 Ford EcoSport offers up cabin space and a low base price, but other Ford SUVs present a better value. As the sixth utility vehicle spawned under the blue-oval badge, the 2018 Ford EcoSport joins a family with a long and proud history of strong sales and good value. It’s distinct enough from the slightly larger Escape to hold its own appeal, but the 2018 EcoSport is hardly fresh out of the bubble wrap, and it shows in some ways that might not be obvious. You may find better utility and better performance in other Ford crossover SUVs. The EcoSport first emerged more than a decade ago, in Brazil. The current model has been on sale around the world since 2012; the U.S. version hails from Ford of India, the first U.S.-market car to come from that country. It’s sold in S, SE, SES, and Titanium trims, with a choice between front-drive, turbo-3 models and all-wheel-drive versions with an inline-4 engine. Prices start from just above $20,000, and approach $30,000 in all-wheel-drive SES editions. Styling isn’t the EcoSport’s trump card, but really only rivals like the Jeep Renegade and Fiat 500X score points for looks. The EcoSport’s beltline recalls the same line on a Chevy Trax, but its front end reads more delicate. From the side the EcoSport seems to end abruptly at the rear. Inside, Ford undermines an otherwise simply formatted cockpit with inexpensive trim and lots of cutlines. Most EcoSports are sold with front-wheel drive, a 6-speed automatic, and a 1.0-liter turbocharged 3-cylinder engine. Add the weight and complexity of all-wheel drive and Ford bumps the engine up to 2.0 liters and 4 cylinders. My 3-cylinder tester, at more than 3,000 pounds, generated unremarkable forward motion. Its steering wandered over a mix of road surfaces, but the ride absorbed some pitiful stretches of Everglades hotpatch and it braked responsively. No crash-test data exists, and the EcoSport does not offer the latest safety features, like automatic emergency braking. Base models get a rearview camera, Bluetooth connectivity, and power features, while top models have Bang & Olufsen sound and a bright, big touchscreen. But prices begin above $20,000, and a full-tilt EcoSport outpaces a decent Honda HR-V, or even an Accord Sport with much more passenger space. Ford has penned prettier SUVs; the EcoSport’s interior might look better in fewer pieces of trim. With the EcoSport, Ford does what it can to apply its usual SUV-ish cues to what’s a very short body. 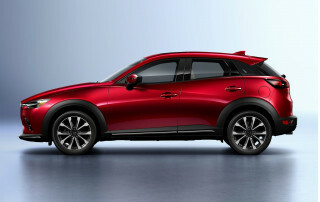 The result is a hatchback shape that’s cropped to fit a subcompact frame. 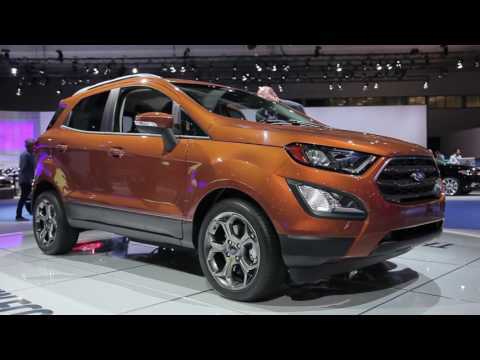 Glance at the side of the EcoSport and one is reminded of Ronald Reagan’s sole memorable movie line, from “King’s Row”: “Where’s the rest of me?” The nose and cabin of the crossover appear normally sized, but its rear ends abruptly like a record scratch on a turntable. A traditional grille and front lights mask the EcoSport’s very tall front end, except when it’s seen in that profile view. It’s nothing new to the Mercedes GLA or the Chevy Trax, with which the Ecosport shares some common cues, especially in its upswept beltline. Inside, the EcoSport doesn't reveal its low-end roots in the shapes it carves out of the dash. Read on for how it’s rendered, but in short, the EcoSport’s trim and materials let down what’s otherwise a neatly formatted cabin. Ford usually leans on symmetry as it balances the fine design touches—little things like the way in which twin USB ports offset other controls on the center stack. 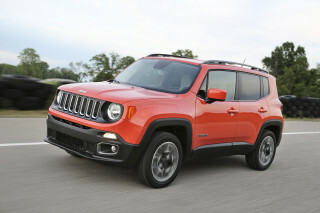 Base models have teensy 4.2-inch LCD screens but pricey models prop a lush-looking 8.0-inch touchscreen front and center. Seats wear sporty stitches across their cushions. The SES dresses things up with generous copper-toned trim on its dash, doors, and seats. Were it missing myriad cutlines and textures and drab matte finishes, the cabin might nudge the EcoSport above the styling average. The 2018 EcoSport skims rough roads rather well, but it’s sluggish. With the EcoSport, Ford fits one of its nicest drivetrains and a short wheelbase. And yet the EcoSport isn’t quick at all, and doesn’t feel particularly nimble. Ford sells most EcoSports with front-wheel drive, a 6-speed automatic, and a 1.6-liter turbo-3 engine. The inline-3 spins out 123 horsepower and 125 pound-feet of torque. 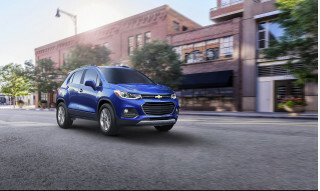 With peak torque delayed until 3,500 rpm, the EcoSport never feels urgent about the matters at hand–and that feeling is not helped by a curb weight of more than 3,000 pounds in any trim, a hundred more than the bigger HR-V. The 6-speed automatic clips off quiet and unruffled shifts; there’s a Sport mode and a shift-toggle switch on the console-mounted lever, but if the shift modes were any less differentiated, they’d be stem cells. Either way, the most common EcoSport will take plenty of patience as it stirs to attention. Choose the simple all-wheel-drive system in the EcoSport—it can split power between the front and rear wheels for better traction—and Ford swaps the 3-cylinder for a 2.0-liter inline-4 with 166 hp and 149 lb-ft of torque. The power boost gets offset by about 300 pounds of hardware, though. On the Titanium’s 17-inch wheels and all-season tires, my EcoSport tester had a wandering eye. Without much centering force programmed into its electric-motor-driven steering, it sniffs the road like a bloodhound as it searches for the straight-ahead scent. Ride and handling aren’t a wash, though: its brakes bite reassuringly, the independent front and torsion-beam rear suspension don’t lean much into corners, and absorbent shocks and tires give the EcoSport a softly cushioned ride superior to a Trax or HR-V.
We’ll add more to this when we drive an EcoSport SES with the larger engine and sport-tuned suspension. The EcoSport can seat four adults in comfort, but cargo space is slim and interior quality is low. 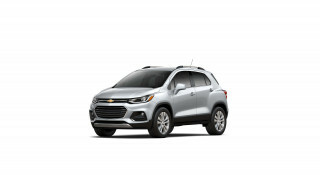 The smallest crossovers make big compromises to hit various targets: price, fuel economy, even overall length, so they don’t compete with other models in their lineups. The 2018 EcoSport crimps corners with below-par interior trim and a shallow, awkwardly accessed cargo area with a high floor. By the numbers, the EcoSport sits 161.3 inches long, and rides on a 99.2-inch wheelbase. 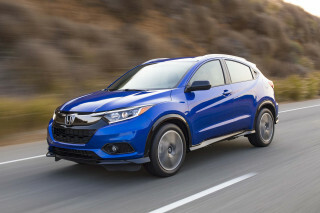 It’s small, compared to the Honda HR-V’s 102.8-inch wheelbase and 169.1-inch overall length. Still, the EcoSport grabs all the cubic inches it can, at least inside the passenger cabin. I drove an EcoSport Titanium with leather upholstery. Base models wear cloth and may have different bolstering, but in the Titanium, the driver seat pads out the seatbacks and bottom cushion with thick, supportive bolsters. It’s not wide enough to avoid constant, regular contact between the driver’s right knee and the console–contact so frequent LinkedIn should study the algorithm. The EcoSport sits high and so do its seats, and that translates into a good driving position. The view ahead is fine despite the car’s tall hood; to the rear quarters, it’s compromised by the upturned rear pillars and small windows. Back seat space is the EcoSport’s best asset in a class full of cramped pseudohatches. The tall stance makes it easy to climb inside. The door cuts are wide enough for big feet. Two 6-foot-tall passengers can ride in back, with a credit card’s worth of space between their heads and the headliner. The rear seatbacks recline at a good angle for road-trip comfort, and they fold down to boost storage space. Fold-down mode expands the EcoSport’s rear cargo space, which at 20.9 cubic feet is at least a roll-aboard shy of the HR-V, and the EcoSport lacks the Honda’s nifty fold-up rear seat bottoms. It’s ultimately less useful, and that fact is amplified by the anachronistic side-hinged rear door. The EcoSport can tote a couple of bags or some weekly foodstuffs, but only if you can get the cargo door open in a tight parking space. Packaging foibles can be overcome, but Ford can build a better interior than this. The EcoSport bristles with hard and soft black plastic trim, lots of pieces, assembled in a jigsaw puzzle on the dash that casts lots of different reflections on the windshield. Some stalks and buttons are common to decade-old Fiestas. It looks cobbled together, rather than assembled. The EcoSport, for lack of complete interior trim, flashes more square inches of body color paint inside than a Fiat 500, which puts it on the dash on purpose as a styling statement. Those aren’t critiques of the EcoSport’s country of origin. 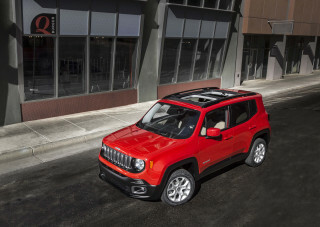 It’s assembled in India, the first U.S.-sold vehicle to come from that country. These are critiques of a relatively high-priced product that wears relatively low-rent finishes by design—and despite all that, does a fine job of smothering road noise that drowns out passengers in some rivals. We’ll hold off on a safety rating until crash-test data surfaces. All EcoSports have a rearview camera, and most models get blind-spot monitors and reverse parking sensors. Beyond that, the EcoSport’s safety offerings are decidedly slim. Ford doesn’t offer front parking sensors, surround-view cameras, adaptive cruise control, or most critically, forward-collision warnings with automatic emergency braking. The EcoSport has been on sale around the world for a few years; while it percolated for U.S. customers, rivals like Toyota have designed new crossovers like the C-HR that include standard automatic emergency braking. It’s a feature that has been proven to save lives and reduce injury, and every new-car buyer should put it high on their priority list. On a happy note, Ford fits the Ecosport with retractable headrests. No more seats that push the driver’s neck well out of alignment. Just pull forward on the headrest, and it cinches back to a normal human sitting position. The 2018 EcoSport SE offers the best value in its lineup. The 2018 Ford EcoSport doles out generous standard equipment on all models. 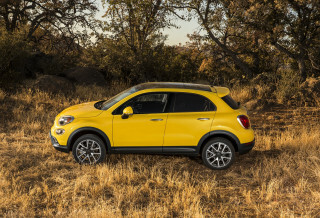 As it marches steadily toward $30,000, it slips to the back in the tiny-crossover pack. The $20,990 EcoSport S has the usual nice things: power windows/locks/mirrors, cruise control, air conditioning, 16-inch wheels, cloth upholstery, an AM/FM audio system with Bluetooth streaming and two USB ports, and a rearview camera. Options include the inline-4 engine with all-wheel drive, remote start, and a spare-tire carrier for the side-hinged tailgate. More EcoSport buyers will opt into the $23,900 EcoSport SE. It gains automatic climate control, reverse parking sensors, steering-wheel audio and phone controls, a small sunroof that opens mostly behind the driver’s head, satellite radio, a 6.5-inch touchscreen, and keyless ignition. Ford bundles blind-spot monitors, navigation, and a lovely high-resolution 8.0-inch touchscreen in an option package. It sells remote start and 17-inch wheels separately. The $26,735 EcoSport Titanium ventures into compact-crossover price range as it gains leather upholstery, 17-inch wheels, navigation, an 8.0-inch touchscreen, Apple CarPlay and Android Auto integration, and Bang & Olufsen audio, a welcome upgrade that delivers good sound on a budget. It may be the only available sound system in this crossover class that doesn’t make you regret the very existence of music. 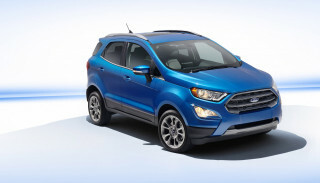 Ford makes all-wheel drive and the bigger engine standard on the $27,735 EcoSport SES. 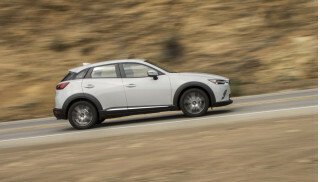 It’s well-equipped but instead of the B&O sound and navigation as standard equipment, it gets some distinct trim and cloth-and-leather sport seats. The 2018 Ford EcoSport doesn’t win the gas-mileage wars, either. The EPA pegs the front-drive, turbo-3 Ecosport at 27 mpg city, 29 highway, 28 combined. The engine hits its torque peak at 3,500 rpm; in most city driving it runs much lower on boost, and sips less fuel. Add weight and displacement with the all-wheel-drive, inline-4 Ecosport and fortunes falter. It’s rated at 23/29/25 mpg. 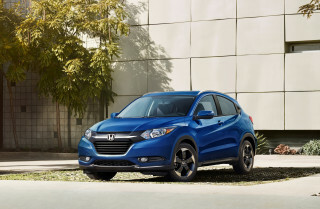 A Honda HR-V whips past the Ecosport at 27/31/29 mpg. (To be fair, it’s the only category in which the HR-V whips past anything.) 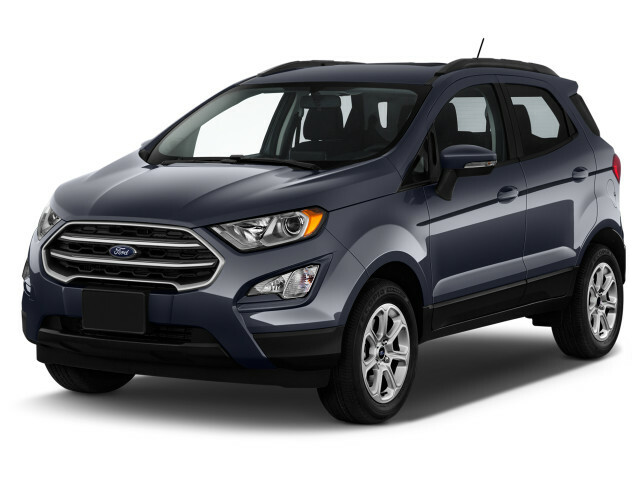 In fact, you could drive a truly entertaining turbo-4 Ford Escape and suffer only a marginal loss in fuel economy. My Ecosport Se is perfect for me.It can turn on a dime,the pick up is just unexplainable. It's not showy,but that's my style.Handles like a glove the small steering wheel suits me.I've driven it all over... My Ecosport Se is perfect for me.It can turn on a dime,the pick up is just unexplainable. It's not showy,but that's my style.Handles like a glove the small steering wheel suits me.I've driven it all over Augusta Ga.Its a tight ride.Smooth sailing what can I say takes curves tight.Just my style for a 50yr old who just turned in her 2005 minivan.I can't say enough about it. The so called experts don't know what they're talking about.I rate it a 10 in everthing.Fun ride love it!Love it.